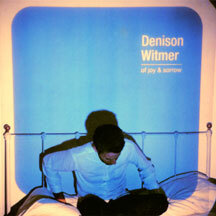 Of Joy and Sorrow is Denison Witmer’s second full-length release, nearly 3 years after his Safe Away debut. This release is a more folk oriented project, with Witmer’s signature vocal stylings accompanied by his quiet, intricate guitar parts, and full-band instrumentation on many songs. This release includes an interactive cd-rom with videos from two live songs not included on Of Joy and Sorrow.